J Swygart | The Lima News Gerrick "Tony" Sheldon, right, listens intently to testimony during his trial on Tuesday in Hardin County Common Pleas Court. Sheldon is charged with complicity to attempted aggravated murder and other charges related to his alleged plan to have the home of his estranged wife burned to the ground. J Swygart | The Lima News Garrett Sheldon was submitted to nearly 3 1/2 hours of cross-examination Tuesday in the trial of his father, Gerrick Sheldon. Hardin County Common Pleas Court Judge Scott Barrett looks on as the 16-year-old responds to a question from defense attorneys. 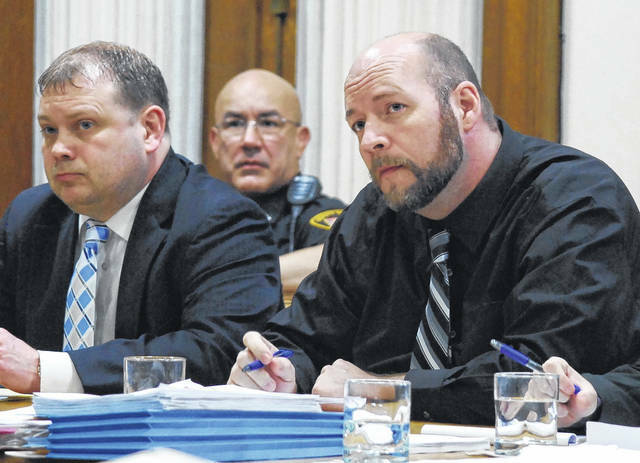 KENTON — Three of Gerrick Sheldon’s teenaged sons took the witness stand Tuesday in Hardin County Common Pleas Court and offered damning testimony by telling jurors their father had asked two of the boys to set fire to the home of his estranged wife and had talked about ways to kill her on previous occasions. Gerrick “Tony” Sheldon of Harrod is charged with complicity to attempted aggravated murder and 14 other charges related to his attempt to get another individual to burn down the house of Danielle Sheldon on Aug. 13 of last year. Defense attorneys spent all morning Tuesday attempting to discredit the testimony of Sheldon’s 16-year-old son, Garrett. The boy was called to the witness stand Monday by prosecutors and testified he was asked by his father to carry out a plan to torch the home of his stepmother. Defense attorney Rocky Ratliff pointed out inconsistencies between statements given by the boy to police and his testimony in court and portrayed the relationship between the boy and Danielle Sheldon as a toxic one. The teenager admitted under questioning that he once had put a laxative in his stepmother’s Margarita mix and had on more than one occasion called the police and children’s services after disputes with his father. Under cross-examination, Trent Sheldon said he was on probation because of a domestic violence incident against his father and said his father and stepmother had once initiated “unruly child” charges against him. A third son, 19-year-old Hunter Sheldon, likewise said he has had a physical altercation with his father in the past. He testified that on the night of Aug. 13 he hoped Tony Sheldon would be caught in the act of attempting to torch Danielle Sheldon’s home. “You really just wanted to put your father behind bars, didn’t you?” asked Defense Attorney Jeff Ratliff. “Yes, I wanted him locked up,” Hunter Sheldon replied. All three boys testified their father had discussed previously how he might kill Danielle Sheldon, with whom he was in the midst of a bitter divorce, or burn her home. Prominent among those plans was a July 4th arson attempt whereby the fire could be blamed on fireworks, the teenagers testified. At one point during Tuesday’s hearing the defense attorneys eluded to a conspiracy concocted by Sheldon’s three sons to implicate their father in the Aug. 13 incident. Also taking the stand Tuesday was Geneva Chrysanthus, Tony Sheldon’s first ex-wife and the mother of Wyatt, Trent, Hunter and Garrett Sheldon. Chrysanthus said Garrett contacted her via Facebook Messenger and told her of the arson plans before he left home with his father on the early morning hours of Aug. 13. The woman said her son assured her he had no intention of carrying out the arson scheme. Testimony in the trial continues Wednesday morning. Prosecutors said it is unlikely the trial will be wrapped up this week. https://www.limaohio.com/wp-content/uploads/sites/54/2018/03/web1_DSC_0176-1.jpgJ Swygart | The Lima News Gerrick "Tony" Sheldon, right, listens intently to testimony during his trial on Tuesday in Hardin County Common Pleas Court. Sheldon is charged with complicity to attempted aggravated murder and other charges related to his alleged plan to have the home of his estranged wife burned to the ground. 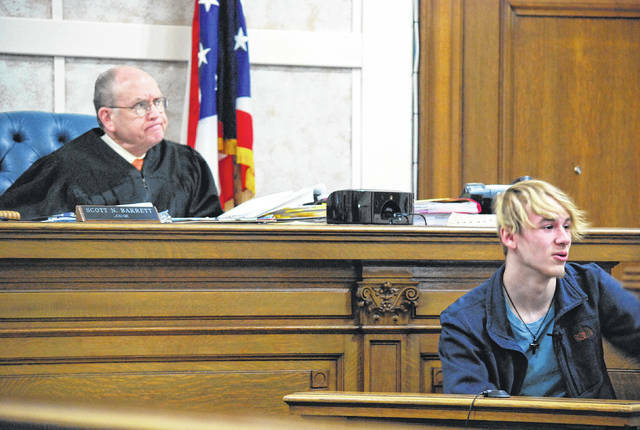 https://www.limaohio.com/wp-content/uploads/sites/54/2018/03/web1_DSC_0177-1.jpgJ Swygart | The Lima News Garrett Sheldon was submitted to nearly 3 1/2 hours of cross-examination Tuesday in the trial of his father, Gerrick Sheldon. Hardin County Common Pleas Court Judge Scott Barrett looks on as the 16-year-old responds to a question from defense attorneys.